If you have missing or damaged teeth, dental bridges can restore your smile and help you chew and speak more comfortably. The treatment is well established, affordable, and able to provide natural-looking results. Dental Restorative Group offers specialty and general dental services to patients in Belmont and Greater Boston. In addition to dental bridges, we provide a full spectrum of restorative, aesthetic, and preventative treatments. This allows us to serve patients and their families with acute concerns as well as ongoing care. If you are considering dental treatment, we invite you to learn more about our approach. Bridges are a set of dental crowns that are connected to one another. Typically, the two crowns on the ends anchor to your existing teeth or to dental implants. 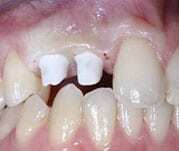 The crowns in the middle float above the gums and “bridge” the gap left by missing teeth. Dental bridges can restore your smile if you have already lost a tooth or several teeth. Your doctor may also recommend extracting teeth that are decayed or damaged and replacing them with a bridge. Extremely common. Dental bridges have been in use since before the era of modern dentistry. Natural-looking and functional. The treatment can give you the look, feel, and some of the strength and stability of your own teeth. Affordable. Compared to other treatments, dental bridges are low-cost. Dental Restorative Group in Belmont and Greater Boston participates in a variety of insurance networks and can help with the filing process as part of your care. Convenient. Dental bridges typically require only a few visits to our practice to complete. While bridges do offer several benefits, they do not have the durability of dental implants, and they require changing the shape of some of your natural teeth. Dental bridges may also not help to prevent bone resorption: a condition in which the bone in the area of a missing tooth erodes. Over time, this can create space between the bridge and the gums. Your doctor can discuss these issues and help you make the right decision for treatment. Visit our offices in Belmont, Cambridge, or Arlington for your initial consultation. During the appointment, your Dental Restorative Group doctor will talk with you about what you would like to accomplish with treatment, conduct a comprehensive examination, and recommend an approach to your care. Your doctor will use local anesthetic to make you more comfortable. 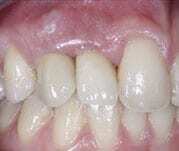 The doctor will reshape the teeth to which the ends of the dental bridge will anchor. This may require filing down or filling your natural teeth. Your doctor will take an impression of the teeth, which our laboratory and technician will use to fabricate your bridge. Having these resources on-site allows Dental Restorative Group in Belmont and Greater Boston to work quickly and oversee quality for a more precise fit. You will receive a temporary bridge until the laboratory has completed the permanent version. In a second, follow-up appointment, your doctor will place the permanent bridge and ensure that your bite is aligned and comfortable. You may also return for additional visits so that the doctor can make adjustments to the look and feel of the bridge. You can expect dental bridges to last at least a decade with proper care. By brushing, flossing, and visiting Dental Restorative Group regularly for examinations and cleanings, you will be able to maintain the health of the teeth that support the bridge as well as the rest of your smile. If you have missing or damaged teeth, find out more about dental bridges and our other treatments. Schedule an appointment in Belmont and throughout Greater Boston with Dental Restorative Group.